This is where I was just before stopping to make dinner on Thursday night. It may look like I have less border units, but not so. I've spread them out to get a better look at what Koriander Kompass is going to look like. I am excited! 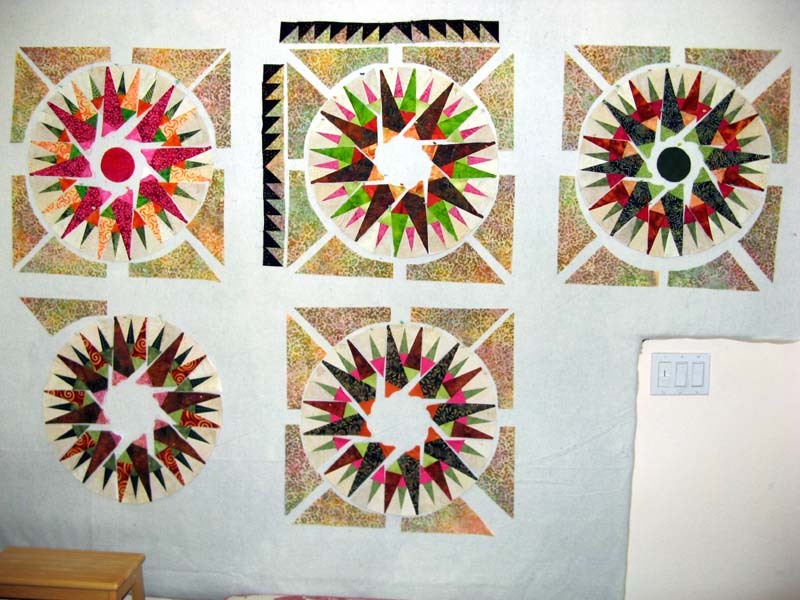 The first photo has the six compasses (left and center) not sewn together. The bottom photo has them all sewn together. 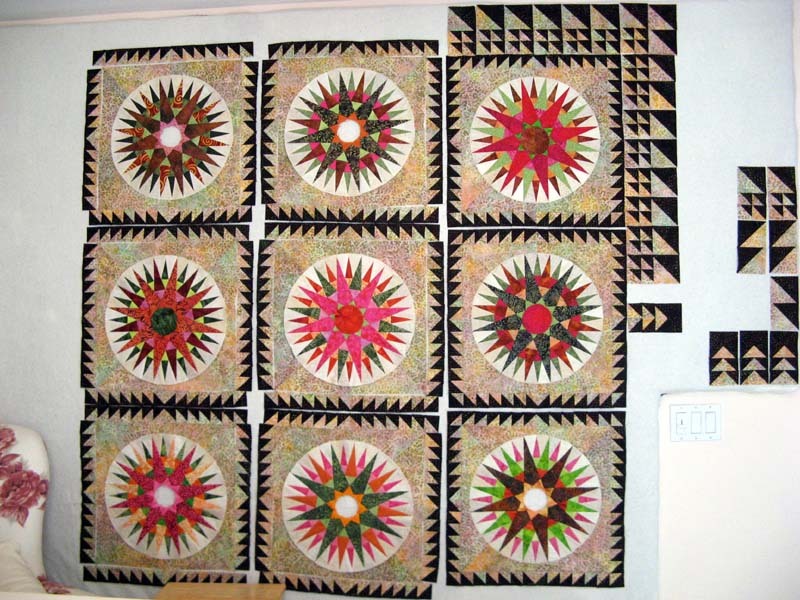 All nine are finished into blocks. I've moved them around to distribute color. This may not be the final layout...what do you think? That real bright one in the middle seems to take center stage. Not sure I like that much. 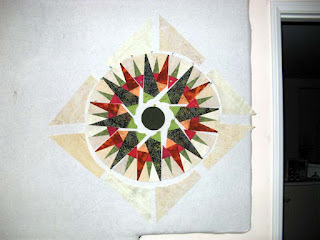 I have nine compass centers to applique into place along with many more HSTs to finish the border. Today is the last day of May. Wonder how much I can get done before Aunt Marti let's us know what project is June's for the Thirteen in '13 UFO Challenge. TGIF everyone! Happy Birthday to my lovely niece, Tiffany. She celebrates her 21st birthday today. Can you remember celebrating your 21st? Here is where I start my PJ day! I got some help from Bonnie and Sue today removing paper from two of the compasses. While they worked on that I was using my Bloc Loc HST Ruler to square up a bunch of 2" units. It takes quite a lot of them to get around each compass. Before Wednesday was done I had the two compasses from lunchtime ready for assembly. The three in the middle are ready to assemble, you'll note they don't quite line up with the three finished on the right. The three compasses on the left are in three different stages. The top one is the furthest from being complete. 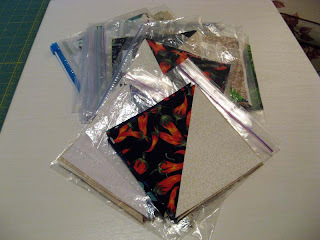 There are more HSTs to be made! Have a wonderful day everyone...Koriander Kompass and I are going to be real close today! Happy Memorial Day. Thanks to those who have made it possible for me to live in freedom. Koriander Kompass is coming right along. 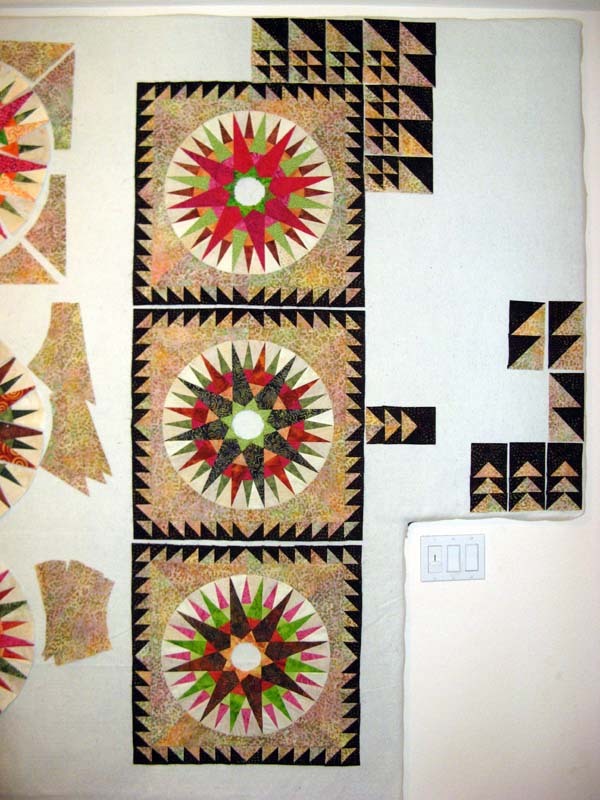 (Pattern information can be seen here, it is #8.) I had a full day of sewing on Sunday. 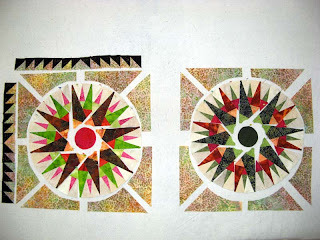 As a result I was able to finish three of the nine compass blocks. They aren't too hard to assemble, but they do take a bit of time. 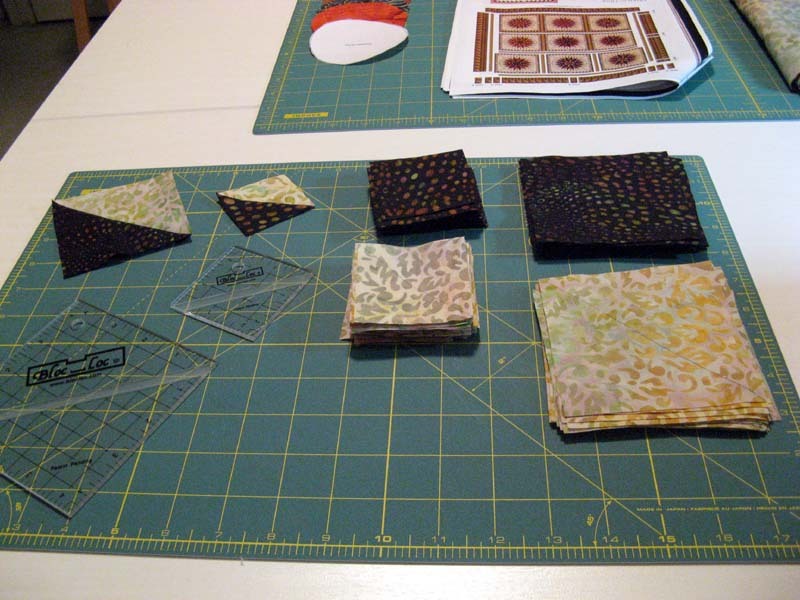 I decided that it was necessary to square up the small HSTs that I had made earlier in the week. They just were not going together well. This project is pretty terrific so I did not want to try to botch it up and end with something I would not be happy with the results. I also thought I would spend my Sunday on border units...so much for that! Still a full day getting these three together. I did make one decision once the compasses were together. The centers matching the large point units does not work. They just do not stand out that much; too matchy. The middle triangles are not large enough to provide separation. 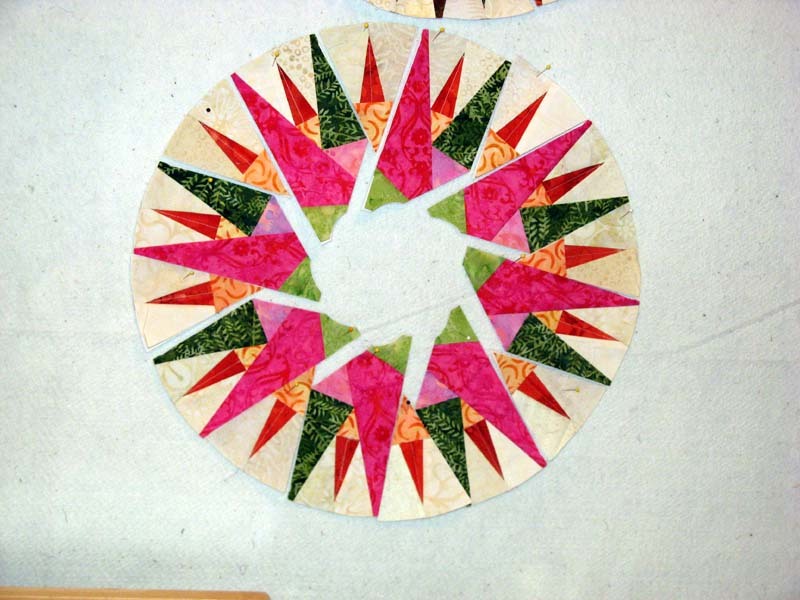 What seems to look best is to pull in either the small points or one of the two outside ring fabrics. Today I plan to work on assembling more compasses. Part of the reason it takes so long is the pulling of the foundation paper. 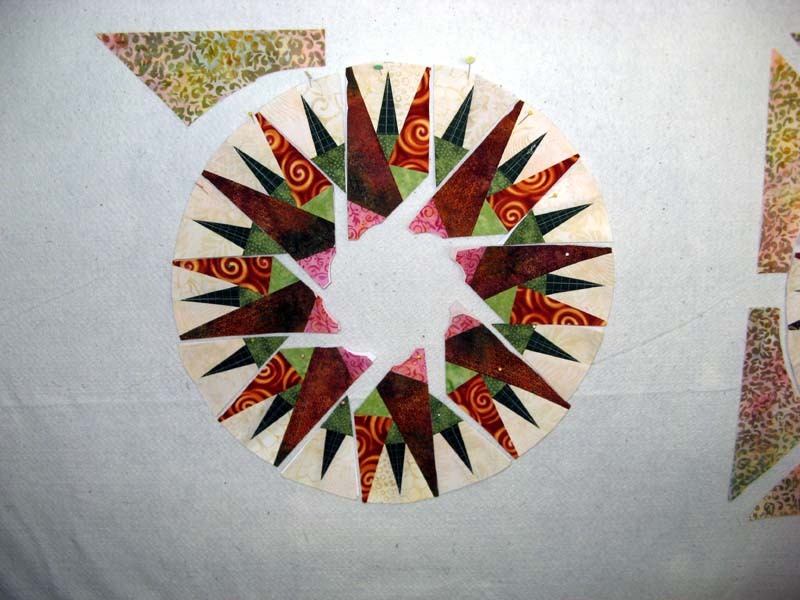 Sewing the background to the compass has been much easier than I had originally thought. 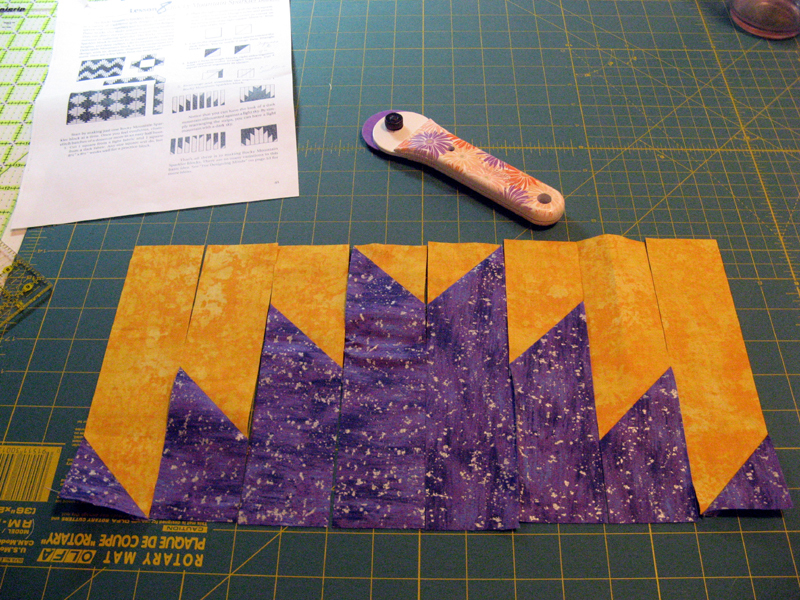 I will need to assemble more of the smaller HSTs for each block. 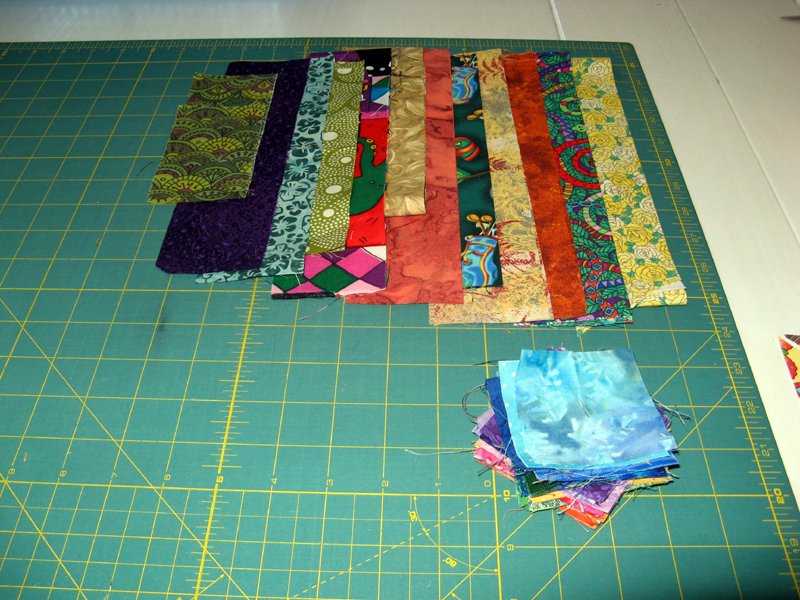 Each one is trimmed down to 2" (finishing at 1.5"). Maybe I will get a few of the border units done along the way. 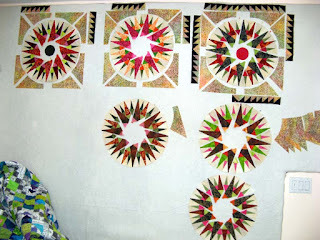 If you want to see more inspiration today there are other Design Walls to view through the links at Patchwork Times. Let me start with the a small purchase. 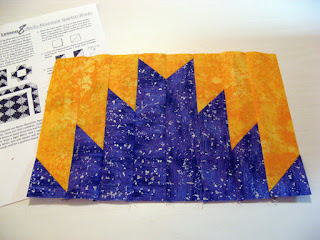 Just one FQ from Beverly's for Koriander Kompass. As you can see I've already put it to use in one of the compass blocks. 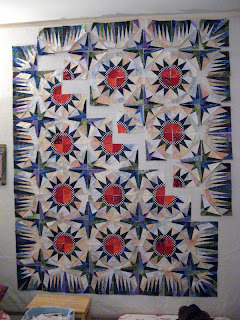 I'll show you more tomorrow of this project...I'm on to the borders! Now I'll conclude with the 3 yards used. All from stash, my 5" HSTs for the block swap that is due the end of June. 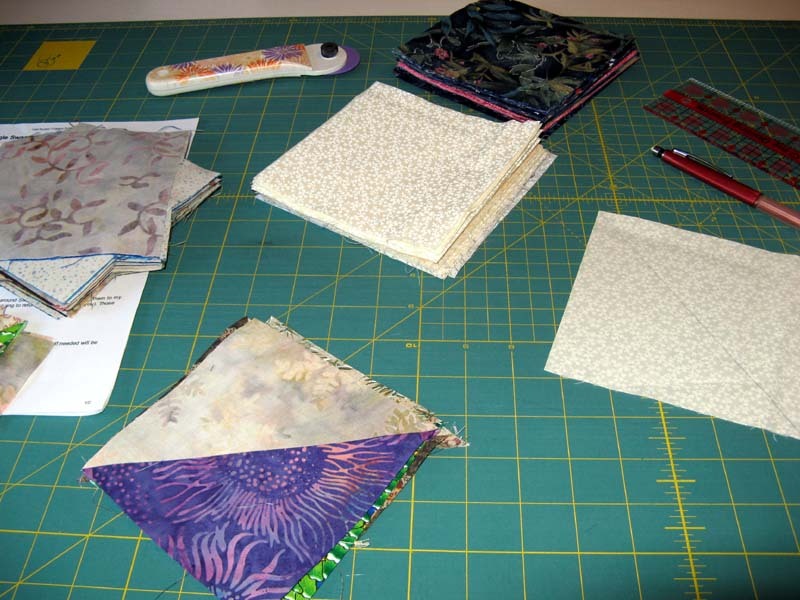 June is looking like it might be a busy sewing month. I am excited to have these done well before June 23rd. 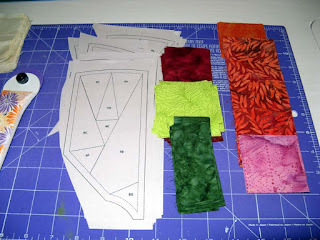 Hope you are having fun using your fabrics. See how other quilters are inspired to use up their stash through the links at Patchwork Times. Here is where I start Friday. I have all of the melons done. All of the backgrounds for them cut. 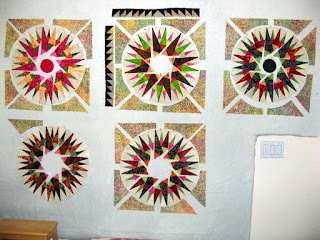 I'm sewing with Kerry today and will leave Koriander Kompass at home. I plan to sew my HSTs for the swap that is due June 23. I have all the 252 squares cut out, 126 of them marked up, and ready for thread. 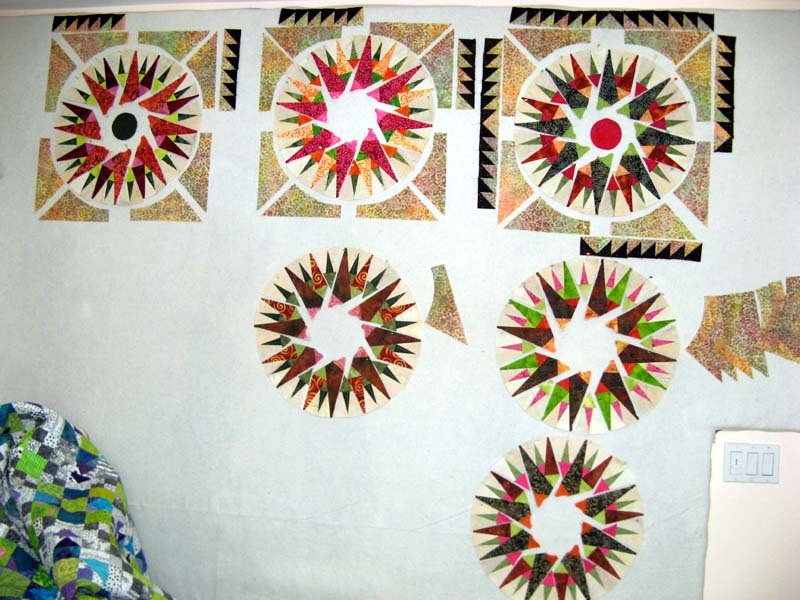 Koriander Kompass is coming along although I don't think I will have it done before the end of the month. Just one more week of May before Aunt Marti selects the June UFO. Happy Wednesday! 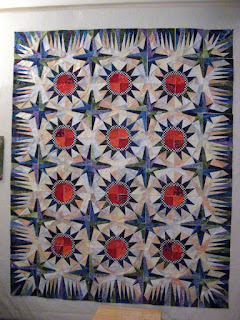 On my way Monday night to meet up with Jeanne for dinner before Canyon Quilt Guild monthly meeting, I stopped by Beverly's. I was hoping to find a printy green or pink in a dark shade for one of the last two remaining compass blocks to be made. This one isn't exactly what I was looking for but, since I've made a few pink projects it's one color I don't have much of. This light pink will work in well so a FQ came home with me. Beverly's has a nice Memorial Day Sale this coming Sunday and Monday...all fabric 25% off! When I got home I received a package from Janet O. I was the lucky winner of her Blog Anniversary Celebration. I received a real special mini quilt, a bunch of FEs, her soaps and a needle nanny. 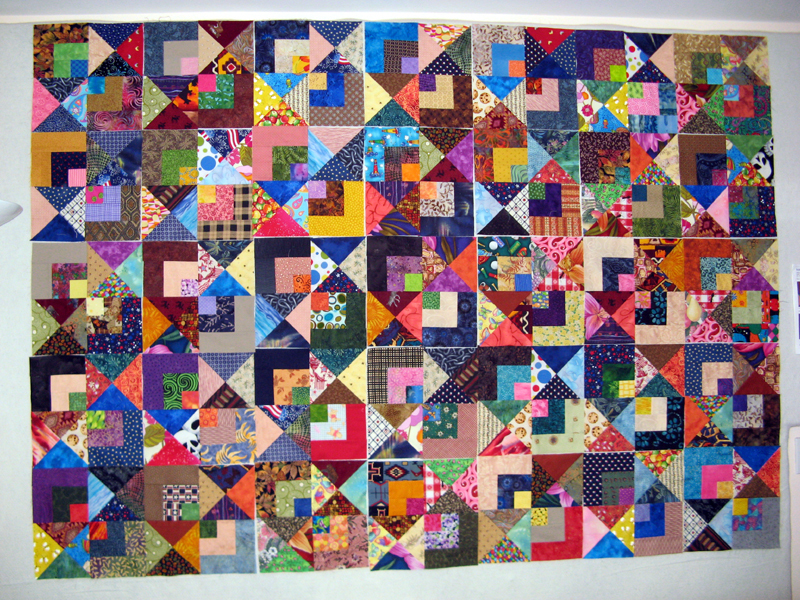 I'm looking for a special place to display her quilt, the FEs are already tucked neatly in my stash, the first bar of soap is waiting for me, and the needle nanny will get a go as soon as I get time to sit down to sew. 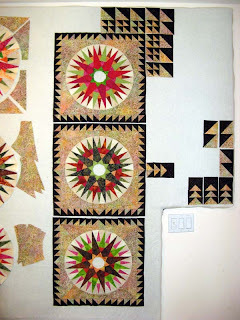 Be sure to check out Janet O's blog; she has lots going on in her sewing room. Thanks Janet. 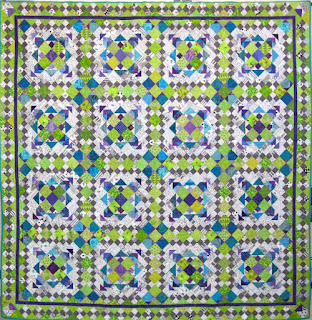 Kushy Kourt 98" x 99"
I finished with the binding yesterday afternoon. 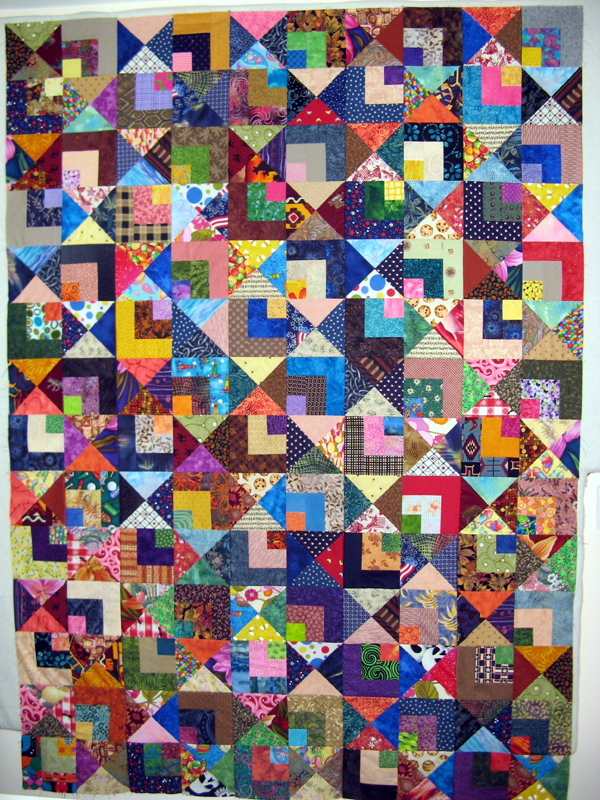 I just love the way Kushy Kourt (Bonnie Hunter's Easy Street) turned out. I made mine with Bonnie's suggested colors...it was the 2012 Mystery. When I'm using this much fabric I don't stray too far away from the suggestion. 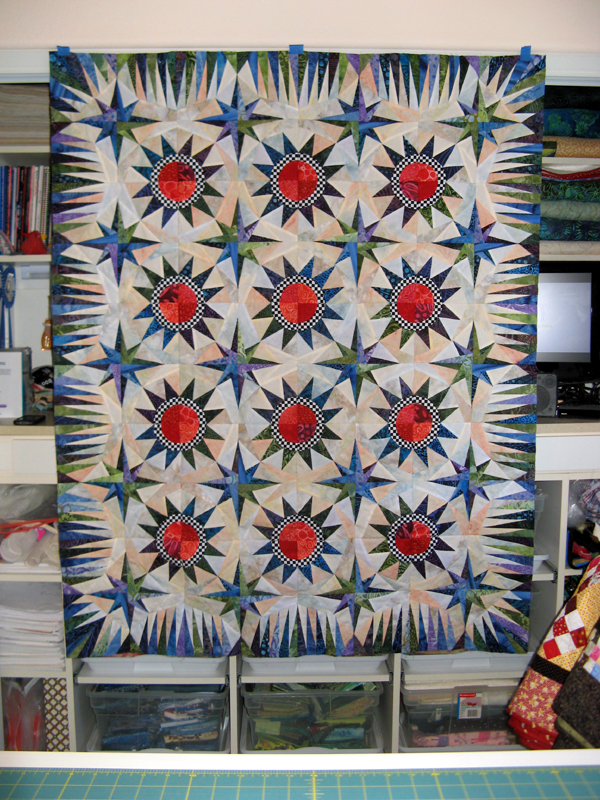 I did change up the suggested border to one that is pieced. The corners were a bit tricky, but I believe I pulled it off nicely. 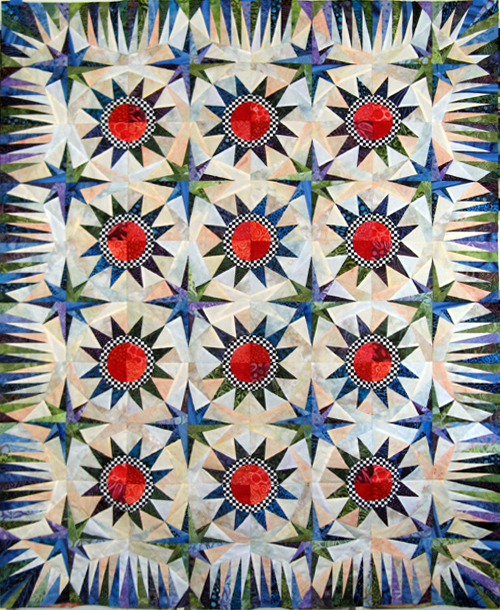 Tonight is Canyon Quilt Guilds May meeting where I plan to share it during Show and Tell. I just finished compass seven of Koriander Kompass. I moved everything around on the design wall so it had a chance of fitting. 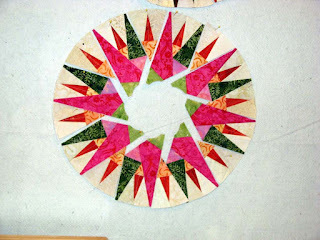 Any ideas on the center circle fabric would be appreciated. I'm not sure if it should blend in or be more pronounced. 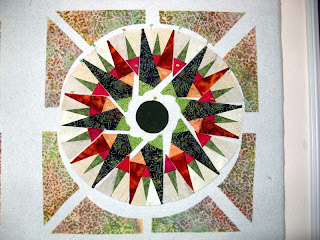 The pattern by Brenda Henning (Spice Island Compass) shows it as being a dark fabric. I haven't spent much time on the border up to this point. What you see started was only to test the background. 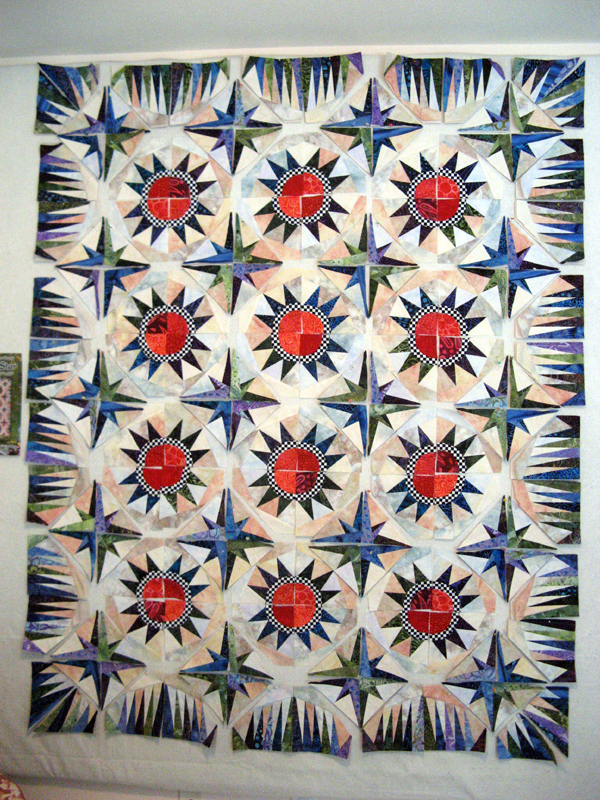 There are lots of other quilters showing their Design Walls today through the links at Patchwork Times. I purchased 9 yards from Memory Lane this week. The background fabric for Koriander Kompass is what escalates the purchase and for a short time my stash report numbers. Its soon to drop off along with a bunch more when I complete this 2011 UFO. I had the black that I'm using in the borders and several other fabrics set aside for quite awhile waiting for me to put this beauty together. If you are interested in more information on Koriander Kompass look at a few posts behind this one. In the bottom left you'll see Kushy Kourt. Still working on the binding. I have two of the four sides done. 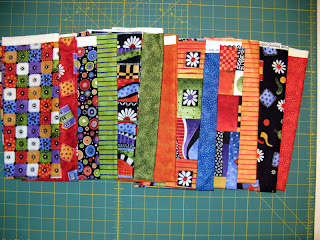 Not too bad using up my stash in 2013 not quite yet the middle of the year. Hope you are having fun using what you have and fun new fabrics in your stash. 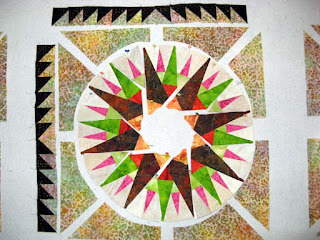 See how others use up theirs through the links of Patchwork Times. This is where I start today with Koriander Kompass. The sixth of nine compass blocks ready to assemble. This collection of fabrics is the last before I repeat fabrics already used. I'm sure duplicates will hardly be noticed, I just prefer not using the same ones...but this project is coming from my stash as much as possible! Next you will see the five I have into segments. I haven't decided how to go for the centers. Any opinions? 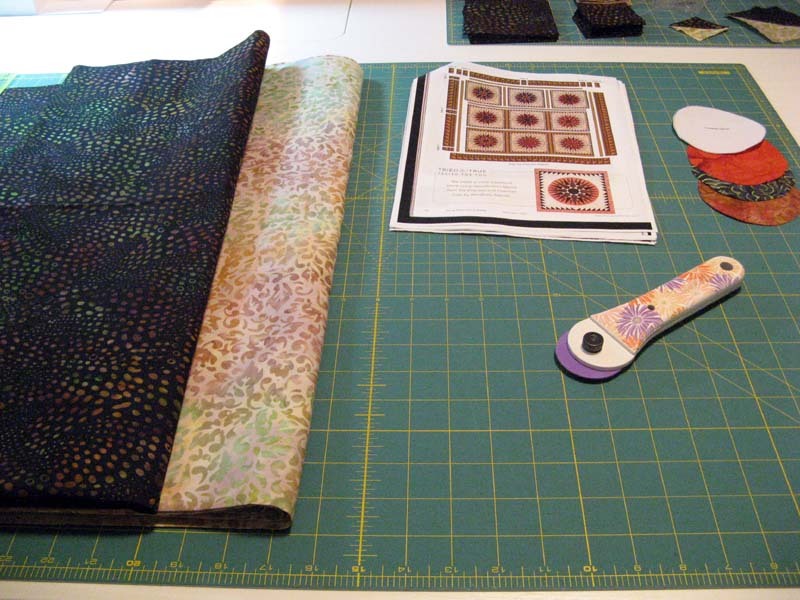 I am also finding time to hand sew the binding on Kushy Kourt. 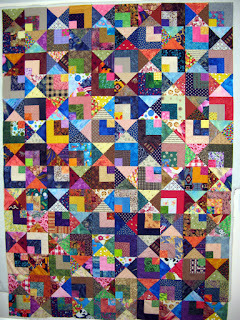 Stop by tomorrow for pictures of my Bonnie Hunter 2012 Mystery Easy Street and my Sunday Stash Report. Happy Saturday. I love Thursdays! Its my day to stay in my PJs and just do whatever comes to mind until dinnertime. Today I'm assembling portions of the border that will go around each compass. I am excited to see that my busy background is working out as well as I hoped it would. 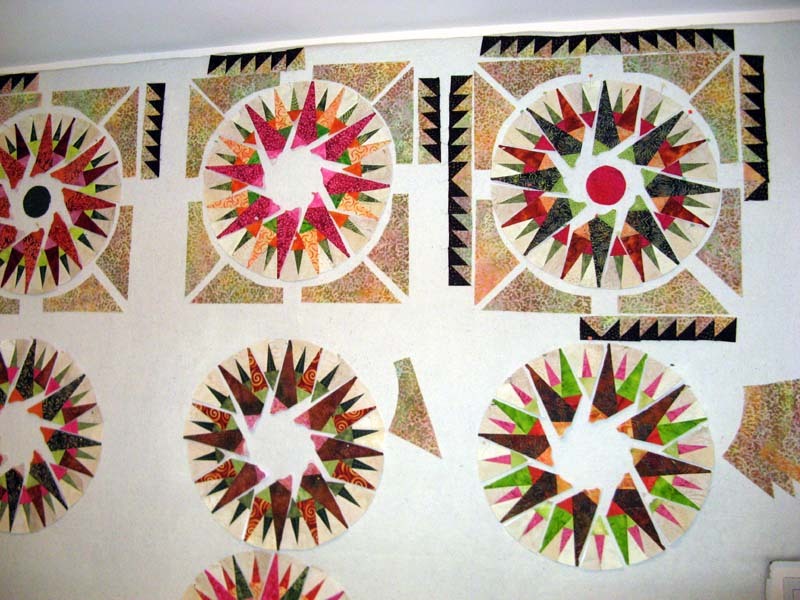 The above photo shows the fabrics for Koriander Kompass. This is a project from my 2011 UFO list that I didn't finish (there are still three others in that state). List of 2011 UFOs here. The units aren't all sewn (yes I'm short one on the top). I'm more interested in piecing all the compass units first. I have two ready to assemble into the next step. The plan is to make all nine compass units different. The next one will have an orange center. Photos really do help with color selection. I like both, but want to stay a little closer to the compass on the left. I like how bright the fabrics are next to each other. 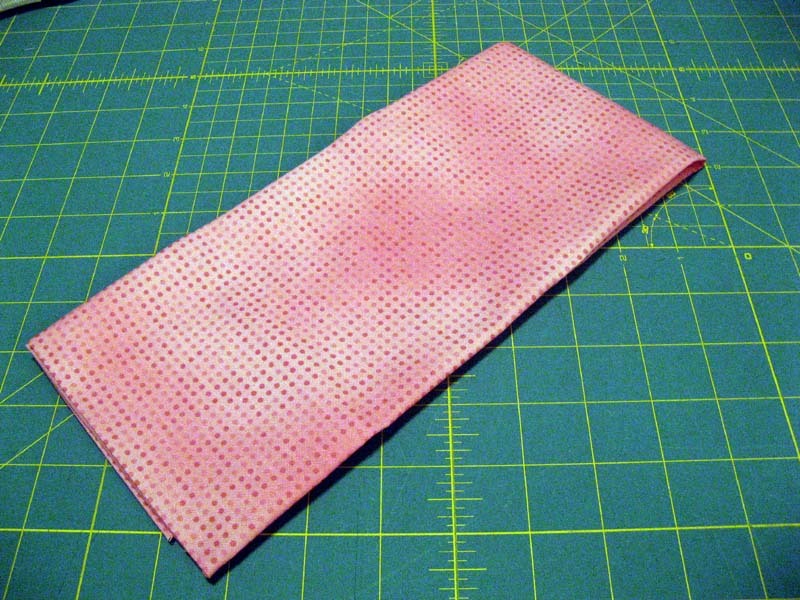 The one on the left is a little darker, perhaps it would have been better if the small pink fabric attached to the small points (there are 16 of these) had been a lighter pink. One of my tasks today is to get the rest of the yardage I'll need of the background. I only brought home a 1/2 yard for experimenting. Memory Lane has it on hold for me in their project room. Hope you have the day to stay in your PJs! Sunshine's Guild meeting was last night. There was a very late last minute change in the program, but it was a fun one. The gals from Butterfly Express Quilting were sure a hoot. 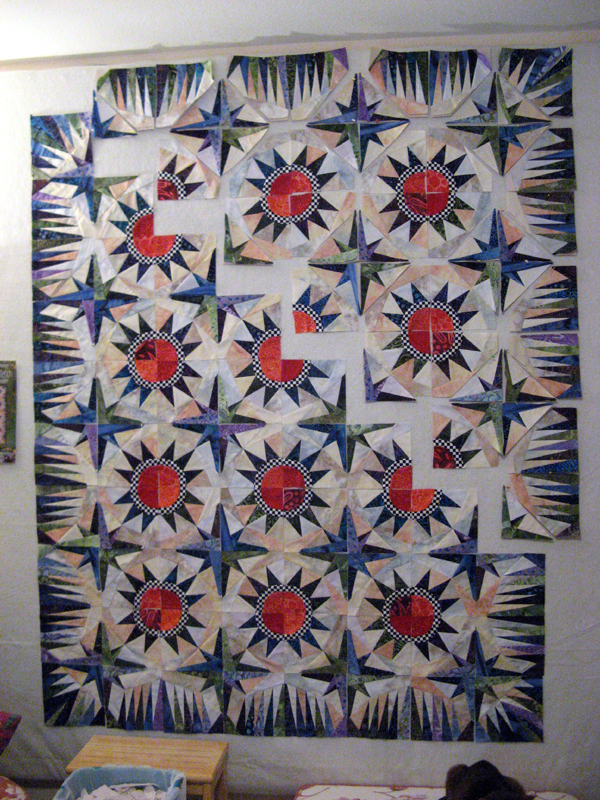 Their hinge quilting idea is a neat one along with their presentation...we were a singing group last night! The first photo are more HSTs turned in by the participants of the current swap. From left to right Mary, Teresa, and Karen have done a nice job. Their fabrics are varied in color with the perfect neutrals. Five turned in with many more to come by June 23rd! The guild had a library blow out. There were all kinds of books being sold for $1. I happened upon an earlier Buggy Barn Book that was calling out to me. I listened and now it's part of my library. 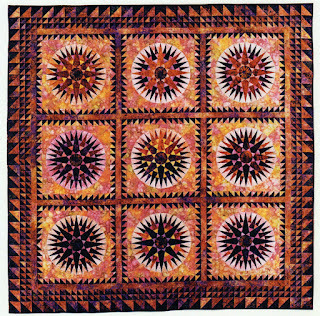 The cover quilt interests me for a stash busting project. 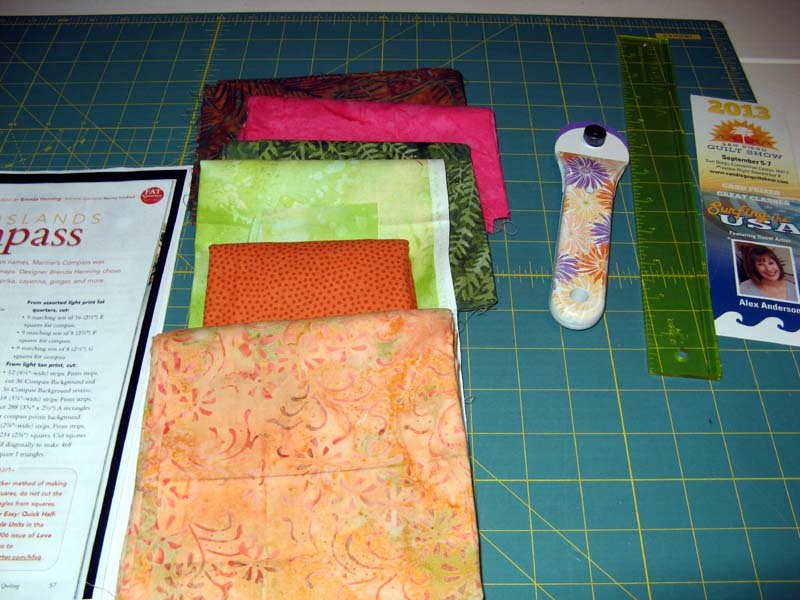 I'm sure I can find enough fabrics that will play well together that are FQs. 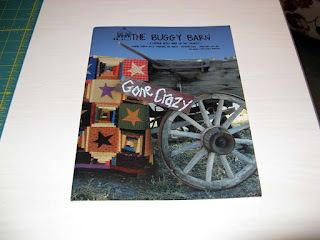 If there was one lesson to learn from the last Buggy Barn class I took its to use FQs. Its just too much work doing otherwise. On my way to the Guild meeting I stopped at Memory Lane to add a couple more fabrics to my current project, Koriander Kompass. 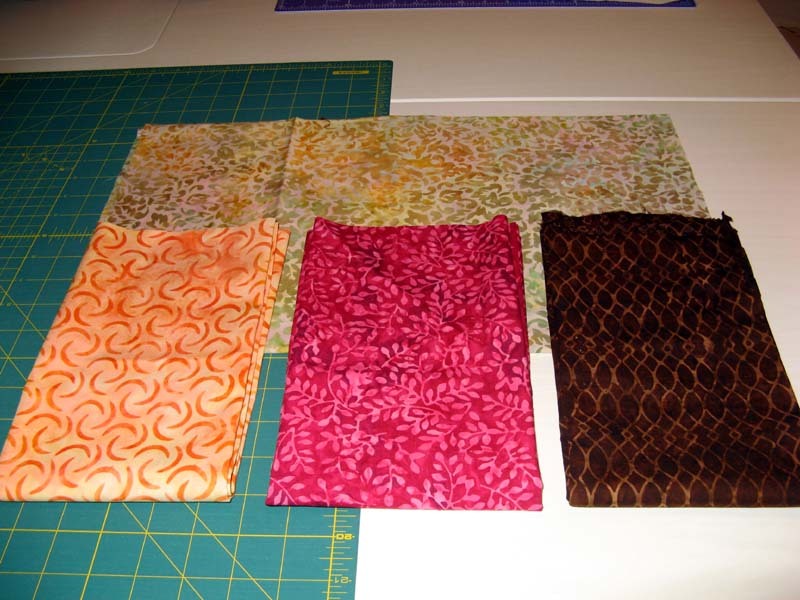 I found three fabrics for it to help with the light side of the oranges and the print side of the darker pinks. 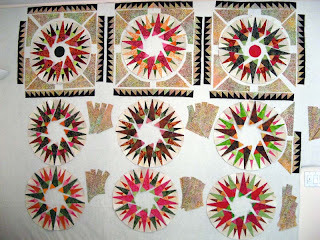 I also found a background that I had to get the opinion of my quilting sisters on using. The combined opinion was to use it. Visit back tomorrow and I'll show you more. I worked on cutting the remaining 5 1/2" squares of dark and neutral for the HST Swap. Today during my lunch break I will mark the vertical center on all the neutral squares. I hope to sew these up during the week. The swap is due on June 23. Two have turned in their blocks to date. 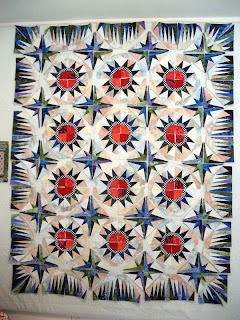 I think I will get a few more on Tuesday since many of the participants of the swap are members at Sunshine Quilt Guild. With the selection from DH yesterday; Koriander Kompass will be next to assemble. As I have been mentioning one of four unfinished projects from my 2011 UFO list. This is an early Brenda Henning design called Spice Islands Compass. 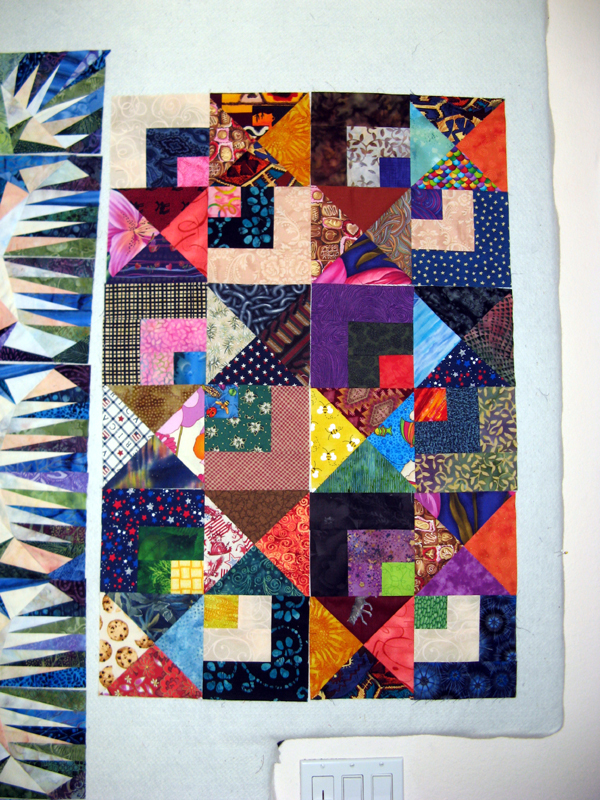 The black on the right will be used for the borders. These three colors fit well with the black and are good complimentary colors on the color wheel. 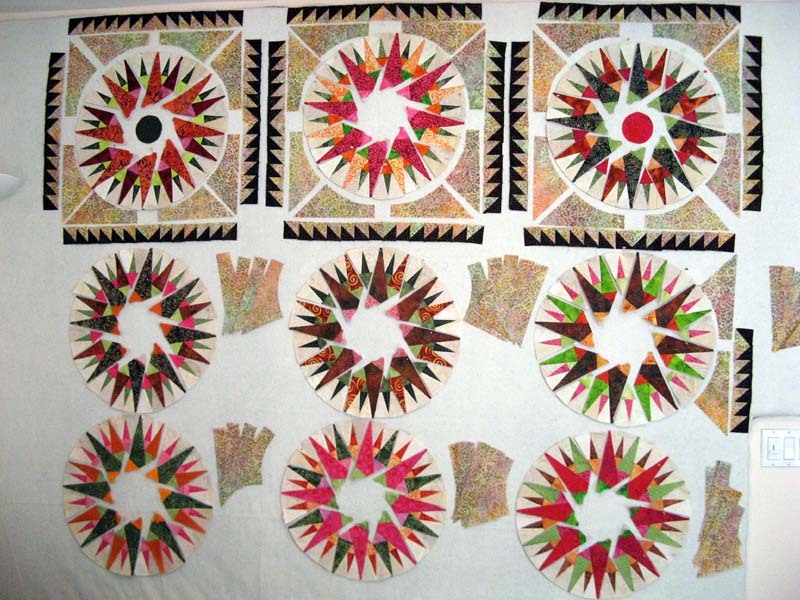 The fabrics are not all batiks. I have thrown in several cottons that are vibrant where lots of times batiks don't get to. I will need to find a couple of darker "printy" pinks and maybe a very light pink. I plan to stop by Memory Lane on Tuesday enroute to Sunshine Guild monthly meeting to see if there might be something on the shelves that will work. This is the first of nine blocks to be assembled. They are not set on point as this arrangement suggests. 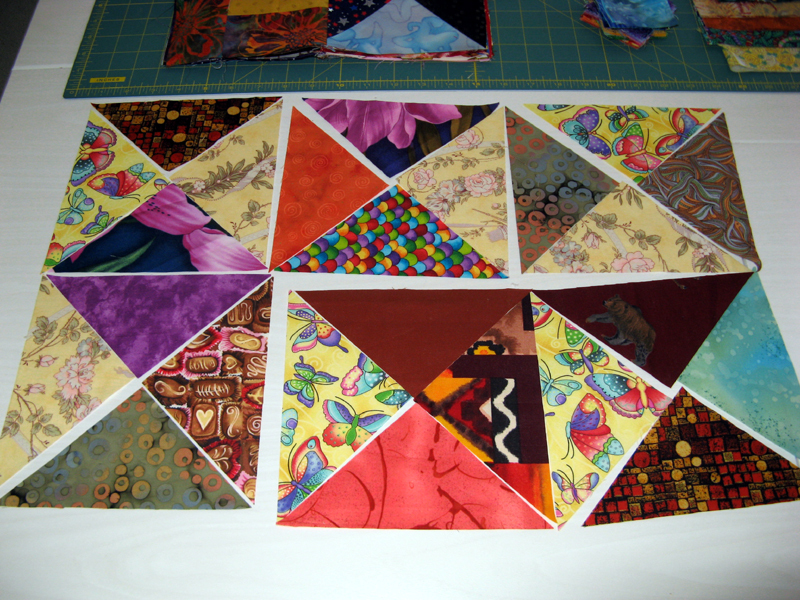 I will work more on the centers before I sew the parts together. 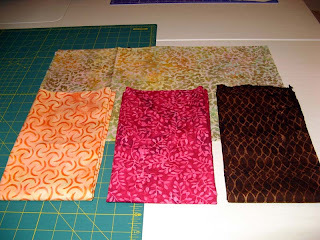 These are the next fabrics I plan to make into the second "compass". They do go together fairly quick. If time works on my side tonight I will have this one together before bedtime. 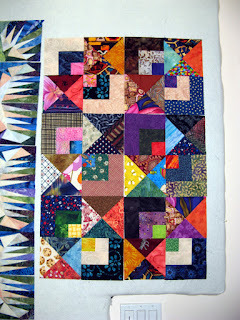 You can see from Brenda's design how the borders are to be. I may reconsider the wedges around the "compass". 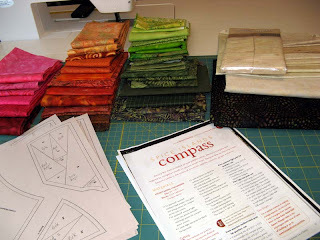 I like the look of the darker background used in her project instead of the same background fabric in the "compass". 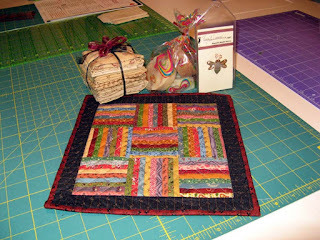 See other fun and incredible projects today through the links at Patchwork Times. Have a wonderful week. I've got a great report this week! I've jumped over the 100 yards used and it's only May still. At this rate 200 yards for 2013 looks very promising! I finished Kartwheels. 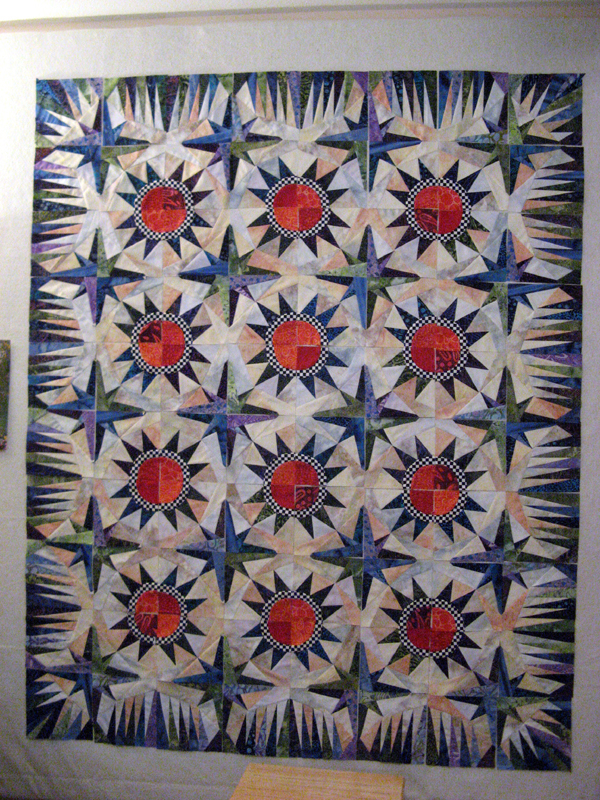 (Judy Niemeyer Mariner's Star.) What a beauty this project has turned out to be. Thank you everyone for all your wonderful comments. 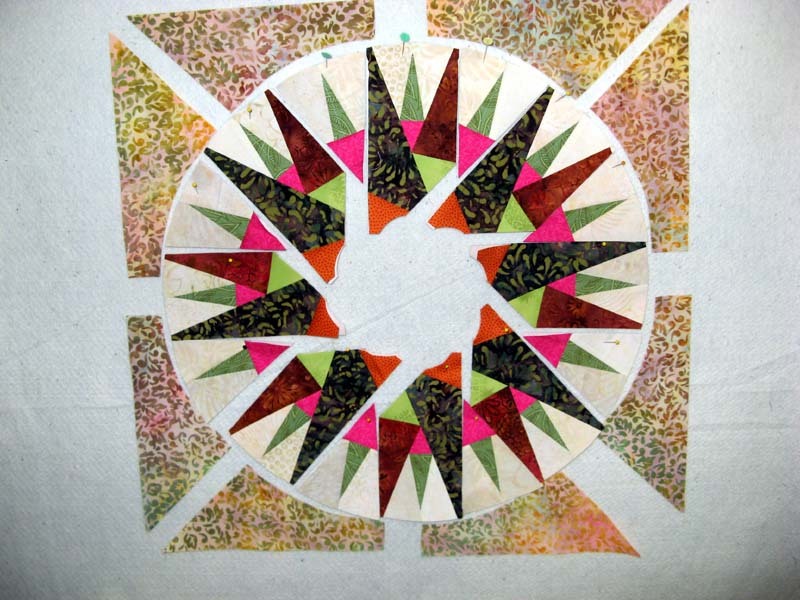 I'm going to be entering Kartwheels in this year's San Diego Quilt Show. I'm sure Kerry will quilt it perfectly as she always does. Kartwheels was started in May 2011; funny that I should finish it the same month two years later. I'll start into another from that year's list. I have four more to finish. Will it be Kaskade (Deb Luttrell Ice Castles), Koriander Kompass (Brenda Henning Spice Islands Compass), Krossfire (Judy Niemeyer Jumping Jax Flash), or Kurry (Judy Niemeyer Briar Patch)? Each of these are as involved as Kartwheels. One of these will challenge me totally for a few weeks until 2013 June UFO is announced. Knautical is done too. 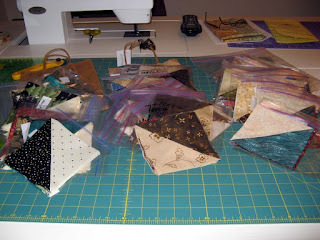 (Judy Laquidara Scraps Ahoy.) 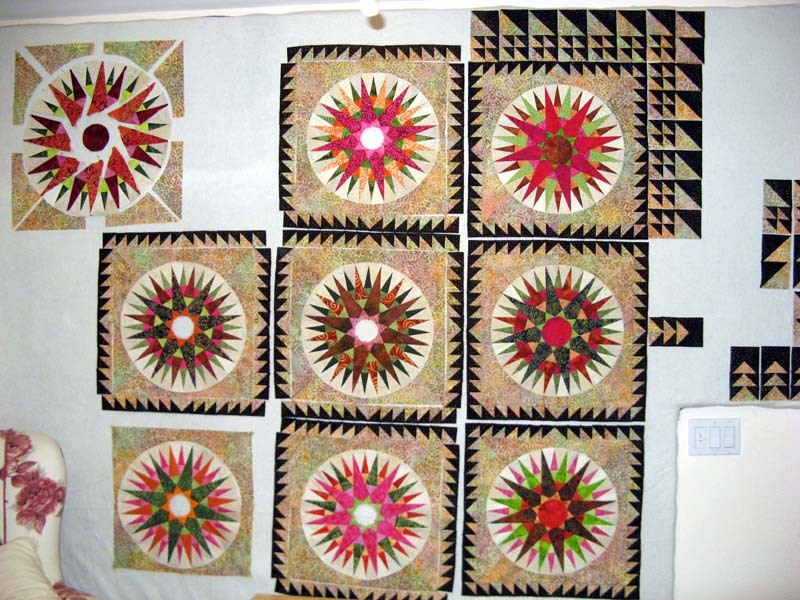 Two totally different quilts you can certainly see. 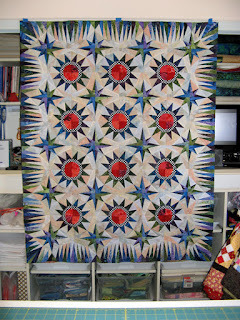 Using up scraps is my main goal and Judy sure helped me do that with her quilt along from a year or so ago. 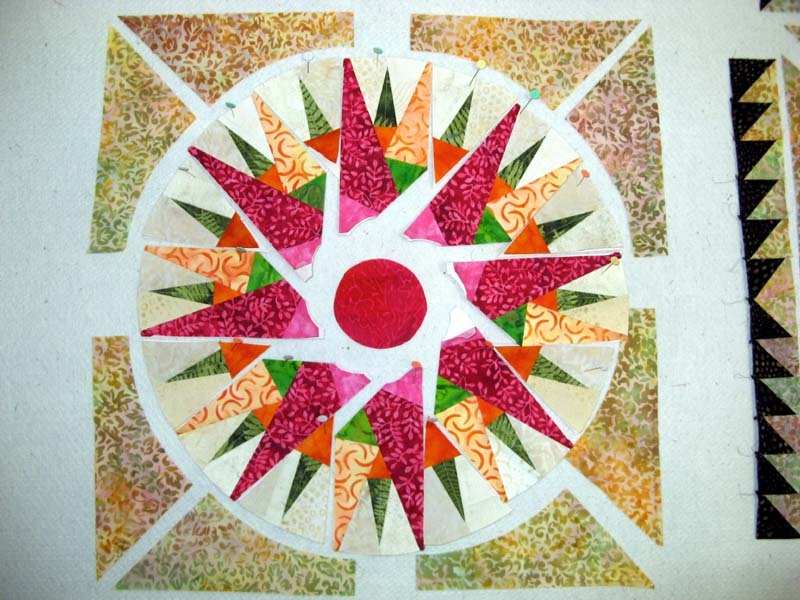 There are more quilters using their fabric stash in lots of different ways. 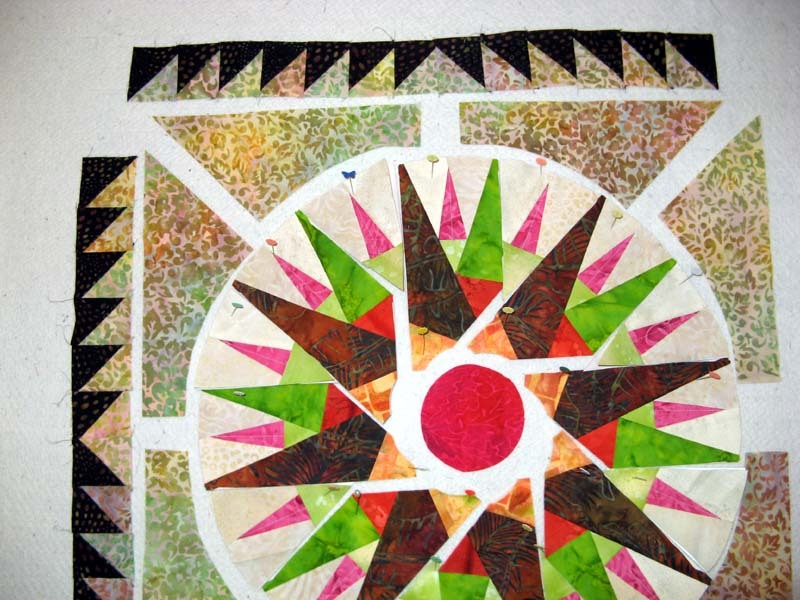 Find time to visit Patchwork Times to see what others are doing. Knautical has replaced Kartwheels...quite a difference in styles you could say! I moved a few blocks around to move the color throughout. I'll be sewing it up later today. Gosh it is a beautiful day here in San Diego and we are about to open enjoy it for a lunch outing. Knautical is just about ready to assemble. I made a lot of progress on it yesterday; completing 27 blocks. That added to the two I already had complete brings a total of 29 as I start today. The top will be 5 blocks across by 7 blocks down. Not sure I'll add a border. I hope to find something big enough for the back in my stash. 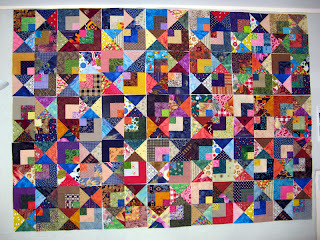 Any long arm quilter out their interested in quilting as a charity project? We all know there are lots of groups with needs. 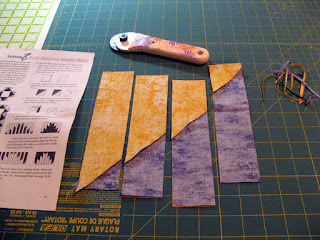 I have the strips ready to cut for the strip blocks. 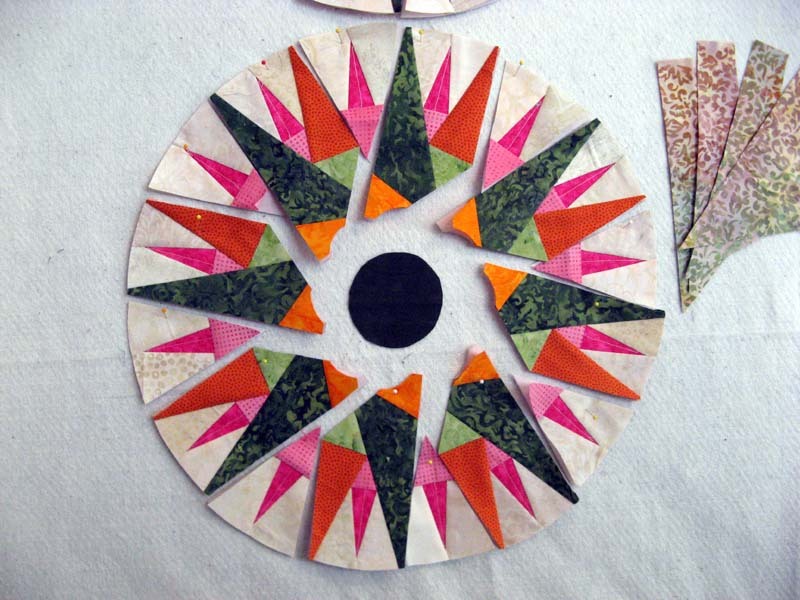 The triangles are ready to assemble for the hour glass blocks. 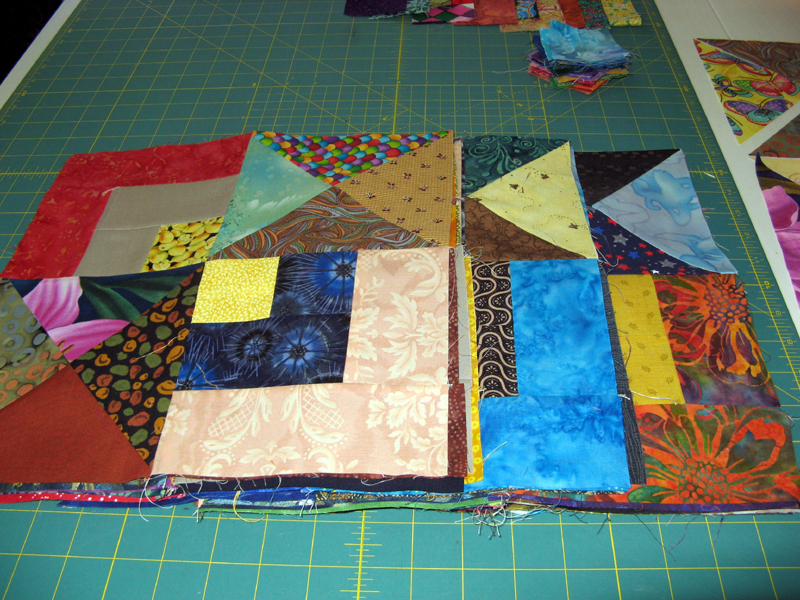 I should have the last six blocks complete before the day is done. Move over Kartwheels...I need the space on the design wall for Knautical! 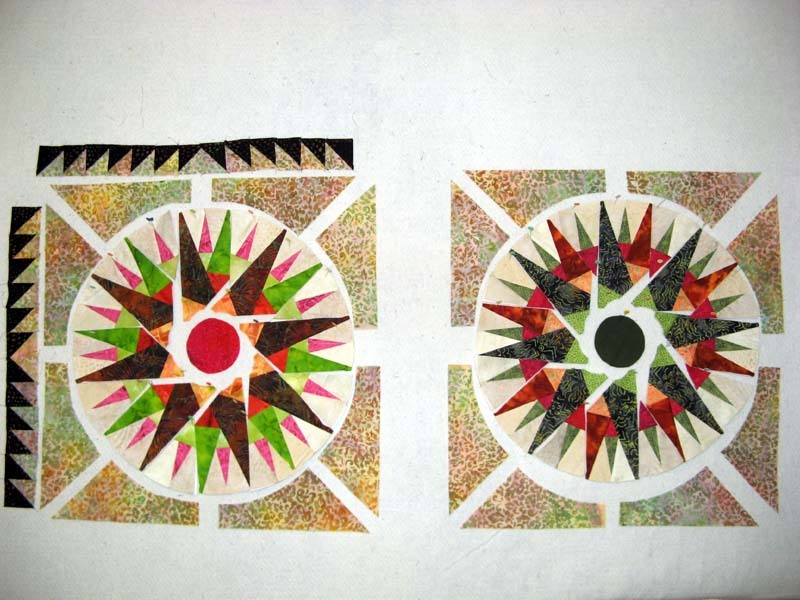 Knautical is a Judy Laquidara design called Scraps Ahoy. I finished the last of the paper removal tonight before dinner. This is where Kartwheels will stay until my 2013 UFO is ready to be arranged on the design wall. 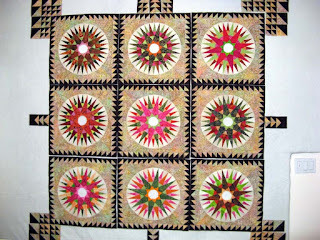 Next I started into my Sunshine BOM for May. The meeting is next week. 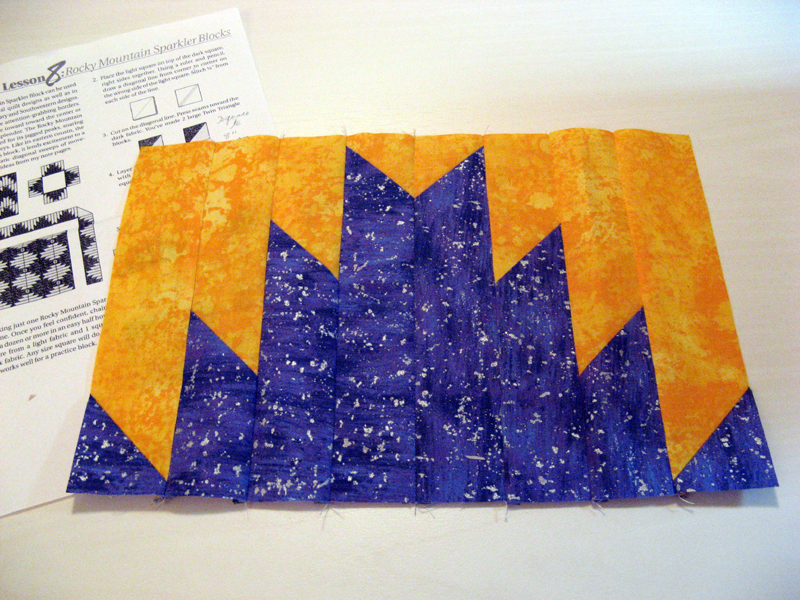 This was a simple block once you figured out what dark color fabric to add. I decided the sparkling mountains needed a sparkle and purple goes great with the yellow that was provided. Below is the HST trimmed to 8" square layered right sides together and then cut into 2" pieces. Today during my lunch break I'll be cutting triangles for the hour glass blocks of Knautical (May UFO) and probably cut a few squares for the HST Swap too. 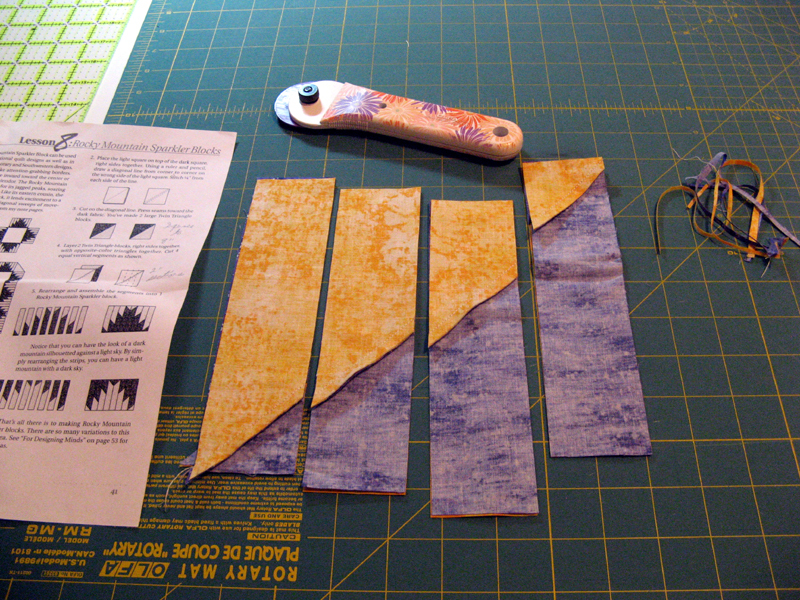 The HSTs need to be finished by June 23rd which will creep up on me quickly. 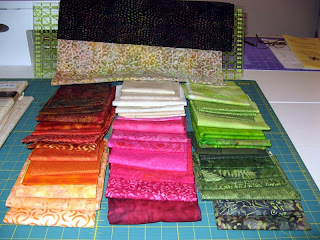 I was so luck to win these wonderful fabrics from Pat at Ocean Waves Quilting Company in Rhode Island. 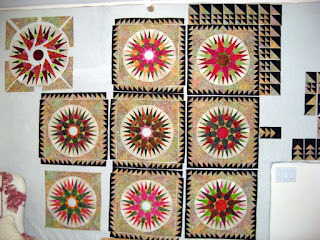 I was a lucky during the Quiltmakers 100 Blocks Volume 7 Blog Hop last week. I'll have to think of something fun to make with them. Thanks Pat! 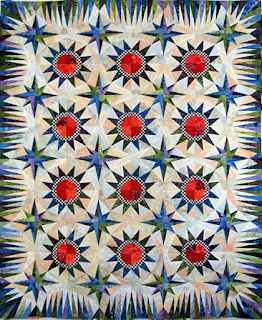 You’ve won the fat quarter pack of Quilting Treasures “Sausalito” fabrics from yesterday’s blog tour. 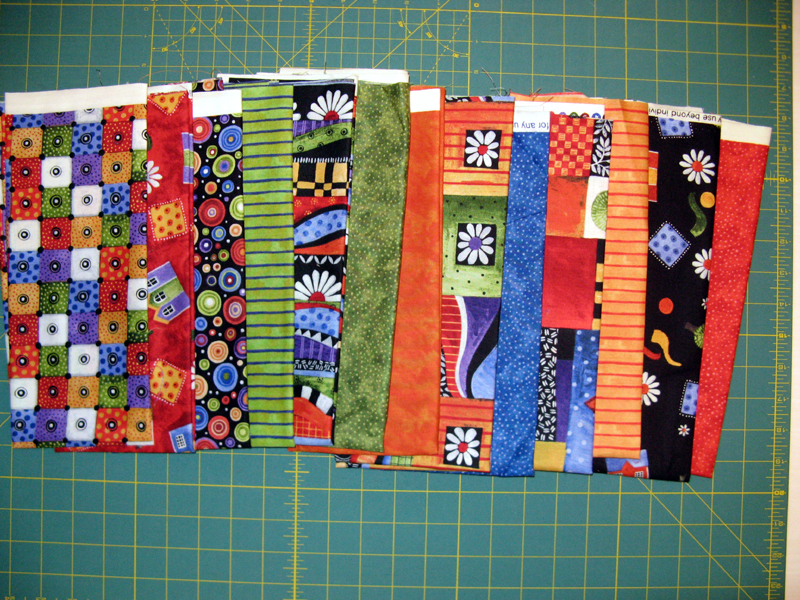 If you would send along your snail mail address, I’ll put the fabrics is the mail to you. 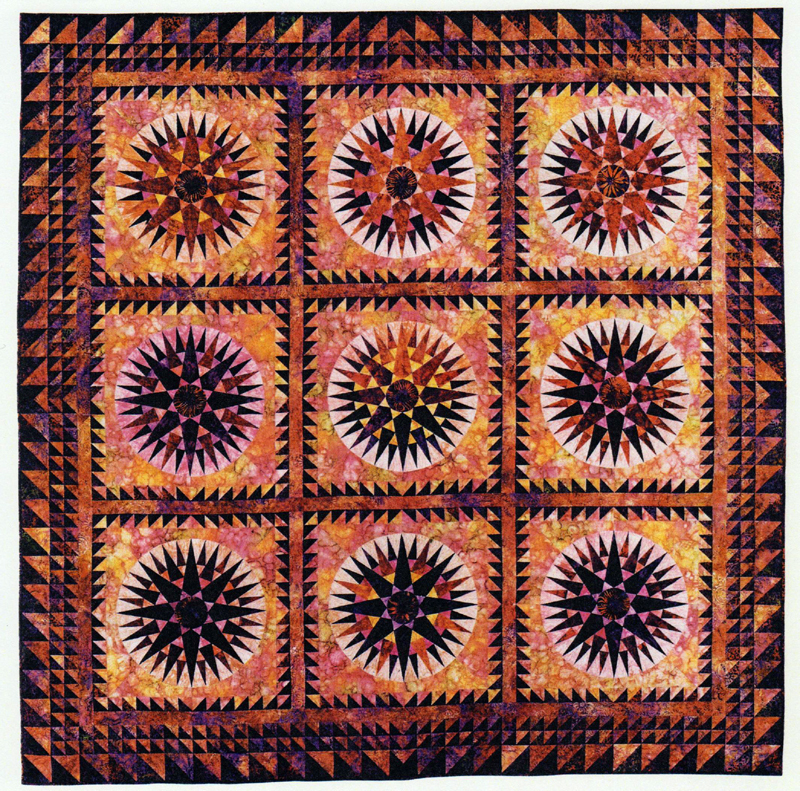 Thanks for participating in the Blog Tour – always fun to hear from so many quilters! I started off Sunday morning with all the pieces done...papers still on all of it except the melon units. It was a long day pulling paper and assembling the units into blocks. 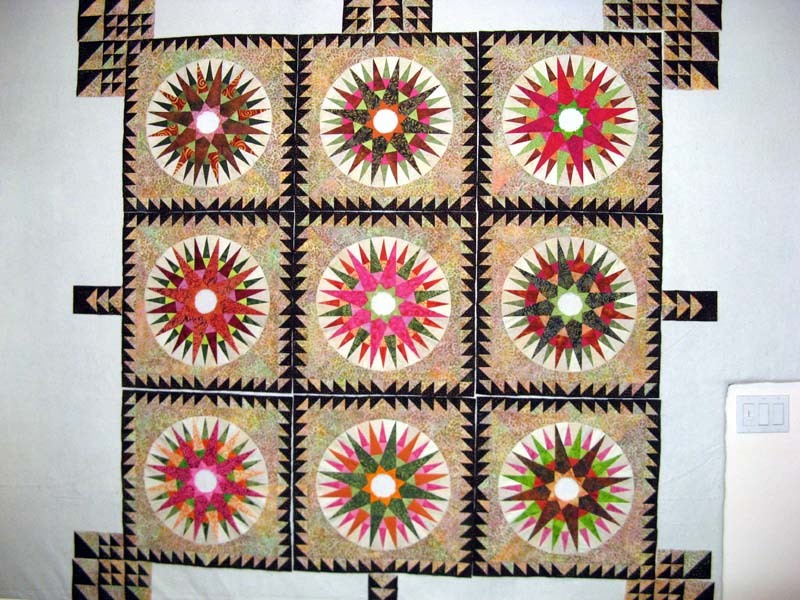 One block (except for the corners) consists of a quarter star and either a melon or border section. You can see I am a little over half done putting the blocks together. 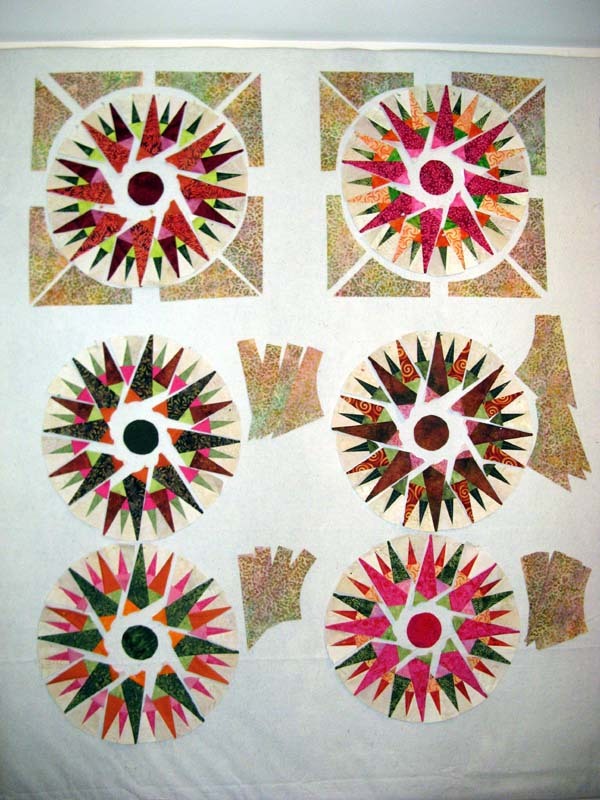 It is easy taking off the papers and adding the two pieces together which makes the 6 1/2" block. 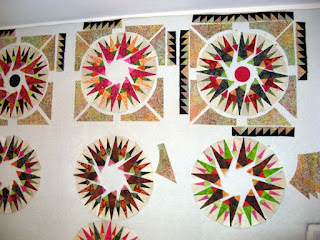 With a little bit of luck I will have the rest of the paper and blocks done Monday night. Kartwheels is looking really nice. It will be so nice to claim another 2011 UFO complete. 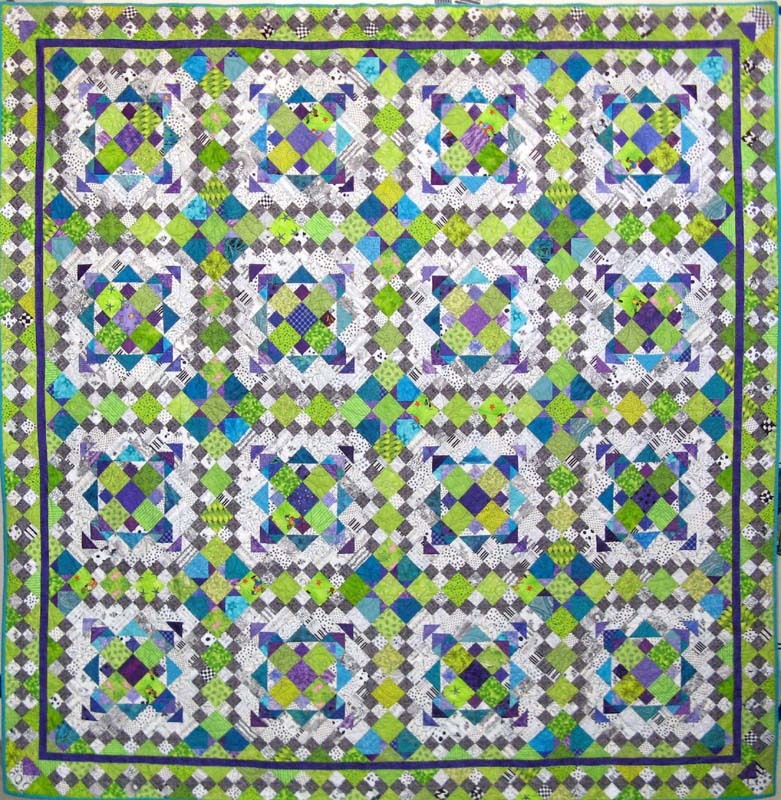 See other projects in work on the design walls of quilters through the links at Patchwork Times. Have a wonderful week.